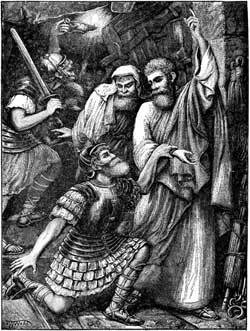 THE PHILIPPIAN JAILOR BEFORE PAUL AND SILAS. AUL AND SILAS were in prison. They had done no wrong, but wicked men had taken them before the magistrates; and the magistrates had caused them to be severely beaten, and afterwards had sent them to prison, where they were securely fastened in an inner dungeon, and their feet made fast in the stocks. This was a most painful position for Paul and Silas. But they were not unhappy. They prayed to God, and sang praises to Him; and they sang so heartily that the other prisoners heard them. It was midnight, and all was dark in the prison. But suddenly there was an earthquake; so that the foundations of the prison were shaken, all the doors were opened, and every one's bonds were loosed. All the prisoners might have run away had they been minded to do so. The keeper of the prison had been sleeping, but the earthquake awoke him. When he saw the doors open, he supposed that all the prisoners had fled; and knowing how severely he would be punished on that account, he drew his sword to kill himself. Paul knew this, and called out loudly, "Do thyself no harm, for we are all here." Then the keeper, who but a little while before had cruelly treated Paul and Silas, came trembling, and fell down before them, and said, "Sirs, what must I do to be saved?" He was afraid because of his sins; and wanted to know how he might be saved from the fearful consequences of sin. Paul's answer was, "Believe on the Lord Jesus Christ and thou shalt be saved." Then Paul and Silas spoke to him about Jesus. He believed, and was baptized; and the next morning the two disciples were set at liberty.